Get In Business Faster with Cascade’s Short Lead Times! Cascade’s PURE PATH 100 is a wiped film distillation system optimized for viscous crude refinement. The vacuum pump is protected with a foreline trap and oil mist return filter for cleanliness and contamination protection. There are a number of different distillation systems on the market. Cascade’s PURE PATH 100 has a few marked differences. The truth is – glass breaks and the distillation glassware is expensive to replace. The Asahi glass on the PURE PATH has an industry leading 110C temperature delta. This means the Asahi glass on the PURE PATH can withstand the temperature shocks associated with rapid, hot to cold temperature changes that could occur with extreme temperature ranges – or when cold ethanol is introduced into the system to clean. Many products manufactured in a distillation system are destined for human consumption. The PURE PATH seals and joints are super smooth, which not only means exceptional vacuum integrity, but that you won’t have to introduce grease into the system in order to maintain vacuum. Lesser quality glass will often slightly leak – reducing performance/output and increase labor efforts chasing down small vacuum leaks. 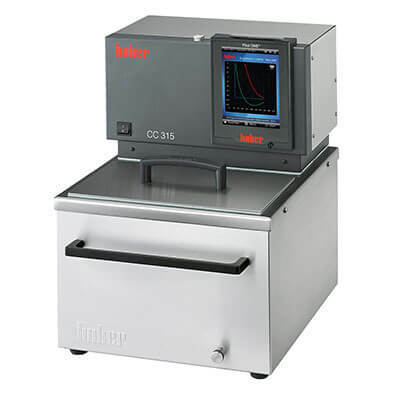 The vacuum system features a UL Listed Agilent DS302 Rotary Vane Pump Since the vacuum integrity of the AGI Glass is so strong, it clears the way for the vacuum pump to get deeper to its ultimate pressure of 2×10-3 mbar. We protect and keep processing clean with a foreline trap on the inlet and an oil mist return. Cascade’s PURE PATH minimizes another potential glass break point by utilizing Rodaviss couplings. 5) Professional on-site installation and training. Our installation and training crew is a team of technicians from Cascade Sciences, Asahi Glass and seasoned industry veterans. Installation is not included in the GREEN series standard price. There are many variables that dictate thru put of any wiped film system. Crude oil will run through at different rates. Depending on initial potency test numbers, expect 2-3 Liters per hour. To produce quality distillate, crude oil typically must run through the system twice.